An exciting day at Symless today, as we successfully tested Synergy running on a Raspberry Pi! Raspbian support has been in our crosshairs for a while, and certainly something that our users ask for regularly. 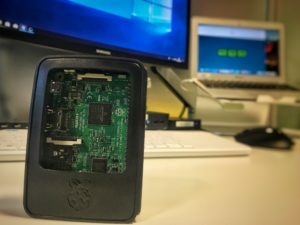 While the Raspberry Pi may have comparatively smaller user base, it is nonetheless iconic, so we're really happy to welcome it into the Synergy family. We will be releasing Synergy for Raspberry Pi soon, so watch this space!